Bio: Skydive would rather read about jet fighters than be one. He's fascinated by the science of aerial warfare and has the ability - within the limits of his design - to duplicate the flying motion of anything he sees. This makes him possibly the most skilled flyer of all Transformers. In jet mode, he can reach speeds of Mach 2.6, and has a range of 1400 miles. 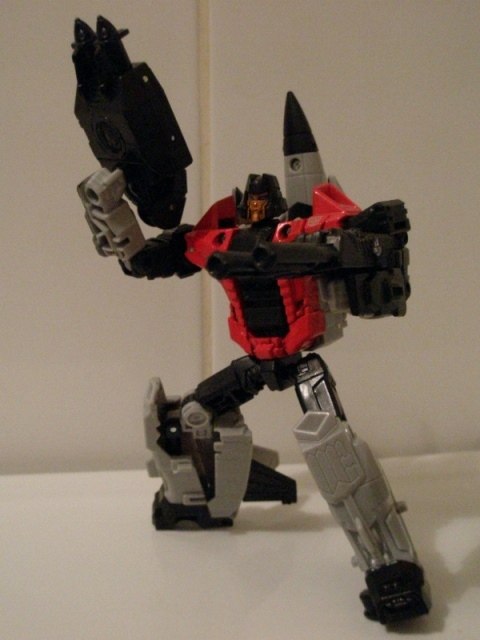 His jet mode is armed with laser guided missiles and in robot mode he uses a nega-gun that crumbles objects by breaking molecular bonds. Due to his acrobatic flying, he's prone to mid-air stalls. 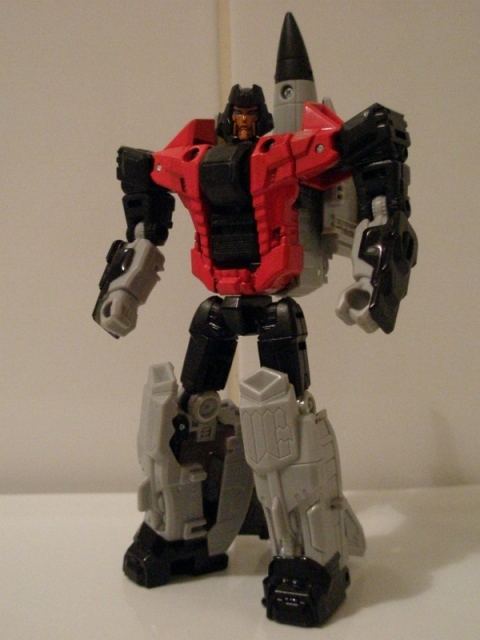 With fellow Aerialbots, he combines to form "Superion". 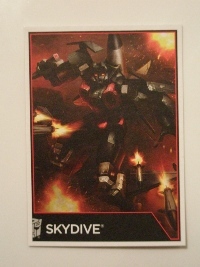 Robot Mode: Oh Skydive, what have they done to you? Where once you had this marvellous cuboid grill face, now you have this plummy lipped girls face, complete with girls hairdo – think 1920s flapper and you're there. I think this is supposed to look like the Sunbow animation model, except it doesn't. It gets the worse the further down his body you get. And I can't believe I just typed that sentence. His shoulders are hilariously wide and I don't think I've seen anything so daft since the days of Dynasty. Next stop on the crap-o-meter is his ugly great planky legs and these orthopaedic shoes that are passing themselves off as feet. Its like there's been design elements for five different characters going on here. There's also a slight case of over detailing present on him, with loads of lines all over him. Its the sort of unnecessary extreme detailing you'd see on some Third Party effort, its just a bit too busy for its own good and just serves to highlight how awful he looks. The colours are the only saving grace of this in flight disaster, well, those and the weapons. The orange face works well, despite looking like a bit of a disaster with the fake tan, and the red/black/grey looks as good here as it did on the original. His handheld weapon is another triumph, being this cool slightly too big set of cannons. The combiner kibble also pulls double duty as a passable missile launcher (non-firing) which is pretty decent. 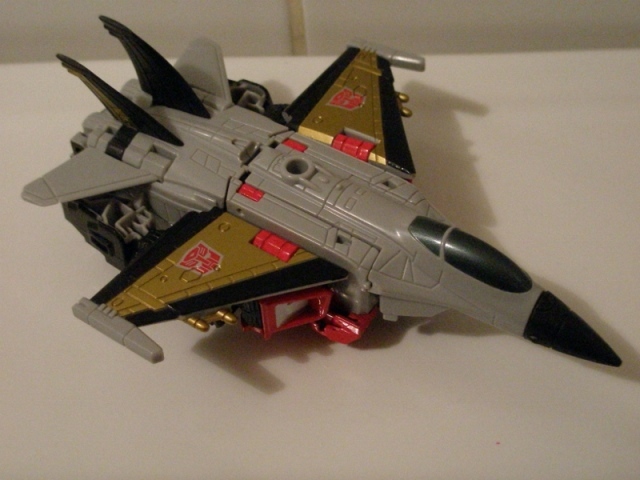 Alternate Mode: The jet mode goes a long way to make up for the mess of the robot mode. 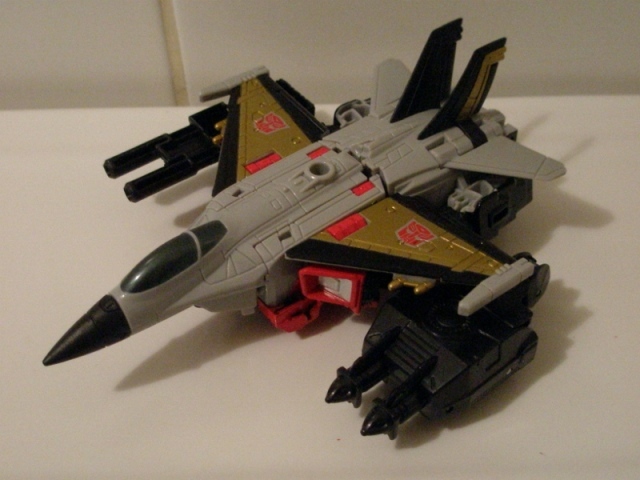 Like the other Combiner Wars Aerialbots, it somehow manages to be far more bulky than an actual aeroplane and even his original toy, but it looks swish enough. From below is a different matter where the big red chest highlights the huge bulk of robo kibble tucked away under there. Still, its not that bad and only the arms being clamped to the fuselage under the wings, plus some extremely droopy rubber tail fins spoil things. The gold on the wings is nice and livens up what could have been a very dull looking grey jet. As with the robot mode though, the detailing is too much! There are lines and lines and lines and lines all over this thing and it really does not need half of the panel lines Hasbro have drizzled all over this guy like salad dressing. Maybe its because he's just a bit too small to pull this off, or the grey and gold colours aren't dense enough to cover up all this nonsense, but it just doesn't work on poor old Skydive here. At least the attack mode looks a little more well balanced, with the cannons near enough matching the bulk of the combiner fist rocket launchers, so he looks a lot less lop-sided.